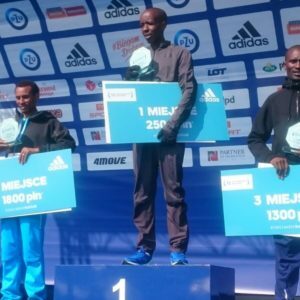 This year’s Warsaw Half Marathon (25 March) could hardly have gone any better for two Run-Fast athletes as Ezrah Sang won the men’s race and Polline Wanjiku won the women’s. Ezrah broke clear of his rivals – fellow Kenyan Hillary Maiyo and Ethiopian Kassa Mekashaw – with around four kilometres of the race remaining. He crossed the line solo in 61:37, his victory as a Run-Fast athlete. His win also continues the trend of Run-Fast athletes excelling in the Polish capital: teammate John Lotiang won this race in March 2017. Polline was returning to Warsaw for the first time since setting the course record (69:06) there in 2014. Yesterday she became the first repeat winner of the race, stopping the clock in 70:01. She had lost all her rivals before the halfway point and her finish time was the second fastest time in the race’s history. Elsewhere, Perendis Lekapana finished 4th in the Venloop Half in Holland in 70:20. Closer to home, Pete Huck continued his fine run of form at the Home Countries International XC near Nottingham, also held on Saturday. Pete finished 4th among the senior men, helping England win the team competition.